If your microwave looks anything like ours, there are plenty of remnants from last night’s (and last week’s) meals. And heaven forbid if you let it sit for too long; that sticky stuff will attach itself for good. We’ve all been there! While there isn’t a hard rule on how to clean the inside of a microwave, it’s wise to give it a wipe down once a week — or when there are a lot of splatters (we’re looking at you, spaghetti sauce). But you don’t have to scrub until you work up a sweat. Luckily, cleaning the microwave is a breeze, if you follow these two tips from cleaning expert Leslie Reichert. Place the water and vinegar in a bowl and microwave on high until the mixture comes to a rolling boil and the window steams up. 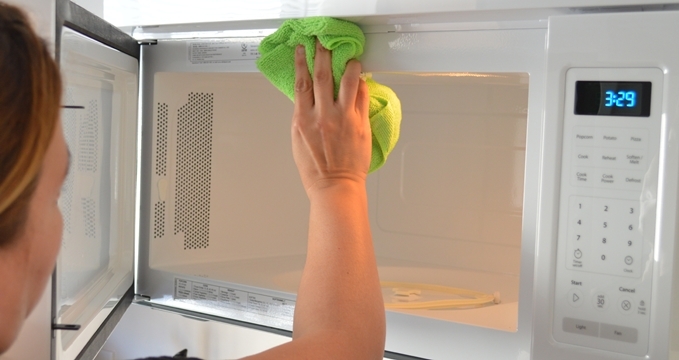 Allow the microwave to cool for a few minutes, then wipe the interior down with the sponge or cloth. Don’t forget to clean the keypad while you’re at it! All you need to do is wipe it with a cloth dampened with warm, soapy water.